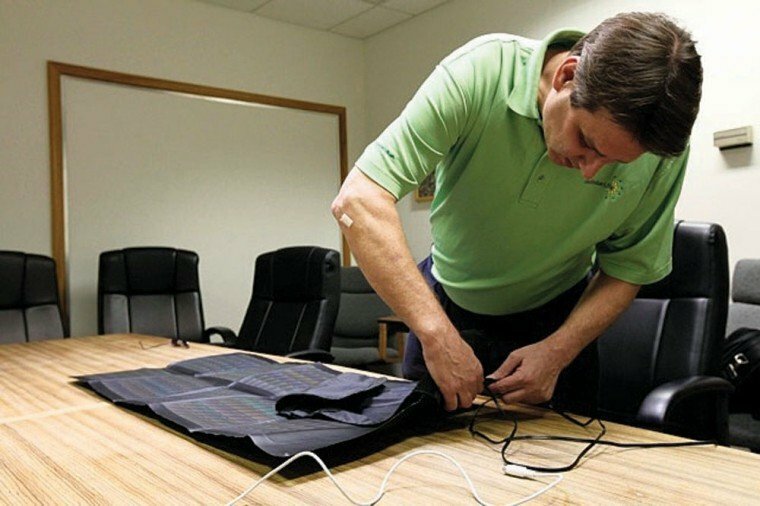 Ahwatukee Foothills resident Glenn Schulke unfolds a supple 4-foot nylon sheet, into which circuitry for capturing solar energy has been woven, and slaps it down on a table. "That produces enough power to keep a laptop charged all day," he said. Schulke noted that his aim is to change the way people think about solar. 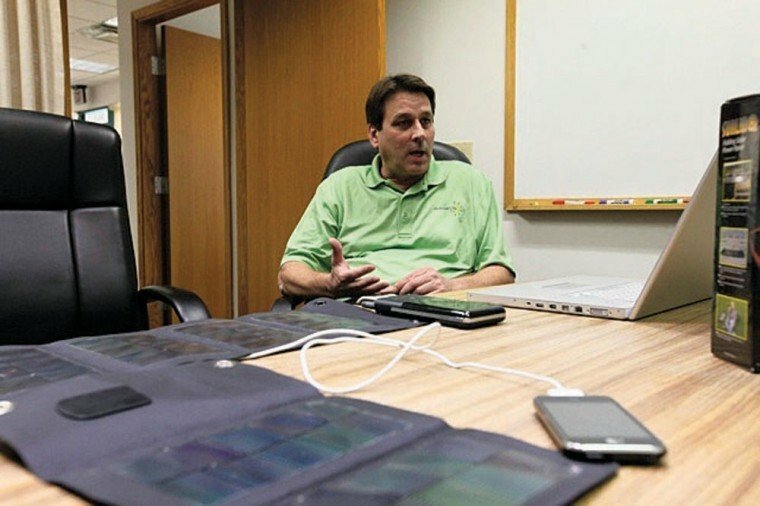 His product, called Sunlinq, can be folded up and used just about anywhere to charge batteries or power electronics such as laptops, cell phones, satellite phones and GPS units, he said. The system's flexibility and portability are a change from the large, rigid panels that often come to mind when many people think of solar power. "Most people, when they think of solar, they think, ‘I want to put panels on my roof,'" Schulke said. "It's really a matter of the general public seeing the applications for themselves and getting an ‘A-ha!' moment." The flexible panel technology came from the military, he said. After he attended an engineering seminar a couple of years ago, Schulke said he realized it could be adapted for the commercial market. He took his idea to Global Solar, which manufactures the panels, and to Tekkeon, which makes the batteries, and began selling the system under the auspices of the company he founded, called GoSolarLife. The company's website, gosolarlife.com, went live about two years ago. The website offers systems of various sizes, ranging in price from $60 to about $950. Sales have grown 81 percent over last year, Schulke said. Buyers have included a doctor on a mercy medical mission to Afghanistan, who used it to power her laptop, camera and satellite phone; a backpacker in Wales who used it to charge his equipment as he hiked around the countryside writing a history book; a photographer on a three-week photo shoot in the Australian outback; and a writer whose summer home on a Greek island had no electricity, Schulke said. He said he sees a lot of potential to market the system to campers, backpackers, hunters and people who use recreational vehicles. "If you're an RVer out in the glory of nature, do you want to hear your generator running?" Schulke said. Sunlinq has urban uses, as well, he said. For instance, it can be put up in a car window and plugged into a cigarette lighter to keep the car's battery powered if the owner leaves it for an extended time at the airport. Users don't even have to sit out in the sun to take advantage of the system. The solar collection sheets can be set outside and connected to a laptop via extension cord, Schulke said. One Ahwatukee Foothills resident is making his way into the world of wedding photography one "big push" at a time.